In Greek mythology, Bellerophon is the hero who tamed the Pegasus. He used the winged horse as a mount to defeat the Chimaera, a monster with the heads of a lion, goat, and snake that breathed fire and devoured villagers. Bellerophon’s many heroic deeds were widely praised, and his subjects adored him. But in his arrogance Bellerophon attempted to ride Pegasus to Mount Olympus to prove himself equal to the gods. Zeus sent a gadfly to distract the winged horse. It threw Bellerophon, who fell to the earth. He survived, but was badly crippled. He wandered the earth, shunned by mortals for his offense to the gods, until he finally died alone. In games, no company is more often accused of epic pride and arrogance than Zynga. 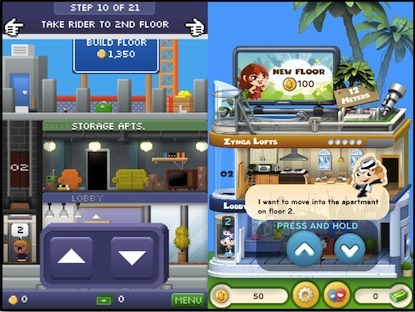 The latest example of the company’s apparent conceit is Dream Heights, a new game for iOS that bears remarkable similarity to Tiny Tower, a successful game for the same platform by independent studio NimbleBit. So similar, in fact, that it’s hard not to look at the two side by side and conclude that the former didn’t seek to copy the latter. Indeed, Zynga has a longstanding reputation for such practices: Mafia Wars, FarmVille, Café World, Hidden Chronicles—all were accused of being copies of existing games by other studios. Some of these accusations led to lawsuits, and Zynga has even filed their own lawsuits against other companies, claiming the very same practice. NimbleBit’s unpretentious and self-effacing reaction does profound rhetorical work. For one part, it completely ends around the fact that Tiny Tower is yet another Zynga-style free-to-play time filler with compulsion loops tied to micropayment opportunities. Some of my fans call those games “cow clickers,” even if they also admit that Tiny Tower is a stylish, “low-abuse” version of that model. For another part, the letter frames the situation as a David and Goliath encounter, the three-man boutique darling facing off against the publicly-traded giant. The letter is a public admission that NimbleBit might not be able to do anything to stop Zynga, but that it can influence the public’s perception of both companies. By showing its belly, NimbleBit underscored its status as underdog. There’s history here, too, as Zynga had reportedly tried to acquire NimbleBit, thus making the former’s apparent copy seem even more bitter and retaliatory. As the creator of Cow Clicker, I’ve got a special relationship with Zynga: that of Zeus’s gadfly. Having had a strong opinion once, I’m supposed to have another for anything the company does or says, ready at the drop of a hat, and singed with bitter wrath. If you believe what you read in the newspaper, I’m One of Zynga’s Most Vocal Critics. In fact, it’s apparently unwise even to mention my name in a Zynga job interview. But in this case, critique is too easy, and not very enlightening. We don’t need to clarify the complexities of legal protection for gameplay, or compare Tiny Tower‘s business model to that of FarmVille, or to debate the ethics of “plagiarism” in games. Zynga’s move seems less like demoniacal vice and more like mythic arrogance. With all the talent Zynga has acquired or recruited, with all their cash money, they can’t even pretend to make original games? After all, what does Zynga really have to gain from copying an iOS game that has already established its reputation and success? Is the potential revenue from new players who’ve never heard of Tiny Tower really worth more than the added perception among the playing, buying, and investing public that Zynga is a company without any of its own ideas, that can’t get in front of the market but can only surf waves created by others, and that doesn’t care about anyone’s perception? This is not malevolence or nefariousness, it’s just dumb hubris. It’s Bellerophon flying to Olympus. As a public company, we might rejoin, Zynga now needs to prove itself to a larger constituency than its investors, its principals, its employees, and its players. Being public not only means that the company’s shares trade on a stock exchange, but also that it has an interest in the way it behaves among the general public and within the game development community. Such an interest need not even rise above long-term self-interest—it certainly doesn’t for most public companies—but it ought to admit that such perceptions have an impact on its present and future success. Come on, Zynga, try harder. Try a little, even. Pretend, if you have to, but make us believe it. Don’t be so cocky. For those who have read their myths, mortals who display hubris always get their comeuppance. As Bellerophon learned the hard way, a man is not a god. Zynga, you are not a god. Isn’t it just as simple as that? Yes and no. The truth is less convenient and harder to face. We now live under a regime ordered by structures we can’t yet fully identify or explain. Zygna isn’t so much its queen Medusa but just one among a media ecosystem of Gorgons. Marshall McLuhan would remind us that the messages of media—individual game releases, in our case—matter less than the structures and sensations produced by the media more generally. In this respect whether or not a mobile-social micropayment tower-building game is forged by NimbleBit or Zynga may make little difference in historical time, even if it does in mythical time. Even if it does in the causes of action in a copyright litgation, or as a rock in the gut of moral rectitude, or amid the caprice of Wall Street. This ecosystem extends much further than just one company or just one industry. As Forbes columnist Daniel Nye Griffiths observed, “as far as we know there are no Chinese workers in giant factory cities being forced to assemble gold-drop Skinner Boxes 12 hours a day for a dollar an hour.” He’s drawing our attention away from Zynga and toward Apple, whose questionable offshore manufacturing practices were recently investigated by the New York Times. Apple’s not alone either, of course; the Chinese factories profiled in the Times also produce nearly half of the world’s electronics. But then again, Apple does produce the iOS devices on which people play Tiny Tower and Dream Heights in the first place. And likewise, for Zynga, its the very infrastructure of data-mining and social-graph mapping provided by Facebook that facilitated their massive, if accidental growth in the first place. For companies like Facebook and Apple, questions of ethics and hubris often rear their heads, only to be batted down as annoyances, like gadflies to livestock. So even if we choose to comprehend Zynga’s blunder mythologically, then who is Zeus, and who is Bellerophon, and who is the Chimaera, and who is the Pegasus? Apple or Facebook could serve the role of the god, and Zynga could be Bellerophon, unless the latter’s trademark bulldog represents the dreaded Chimaera, which would cast NimbleBit as Bellerophon, the hero still awaiting his comeuppance. Or perhaps Facebook is the feral Pegasus, and Zynga its Bellerophon, the hero who tamed it, thus casting the NASDAQ as Zeus, since financial instrumentation takes the place of divinity in secular capitalism. Unless that god-king is instead Apple, whose shiny devices blind us all to their hidden scorn, which topples the once-magestic Pegasus of the stateside manufacturing industry, which hurtles the once estimable, Bellerophonic working class into shameful obscurity, while Zynga and NimbleBit count money in their mountaintop villas. Or from a different perspective that was also in the news recently, perhaps the Chimaera is the film and music industries, whose voracity for human flesh in the form of abusive legislation like SOPA and PIPA can only be stopped by the heroic resistance of the technology industry, whereby NimbleBit, Zynga, Apple, and Facebook all ride together on Pegasus’s able back. It’s easy to hate Zynga, but neither moral turpitude nor mythic hubris sufficiently explains our present situation. Folklore and modernity alike condition us to desire a lucid answer, a simple take with a clear moral: don’t steal game designs, don’t abuse players, don’t exploit workers. Those are decent principles. But they are also stories, and stories are lies whose deception we forgive in exchange for their grace. The truth is murkier and more complex and less convenient. The truth can’t be tweeted or meme-generated or emblazoned on a t-shirt. The truth admits that Tiny Tower is both charming and depraved, with its cute characters and its vulgar micropayments. That games in general are charming and depraved, flooded with cuteness and vulgarity. That videogames don’t quite belong in Silicon Valley nor in Hollywood. That Zynga is pompous, but that the blind arrogance of short-term financial gain is what our society values. That Apple’s shiny objects come at a human cost at home and abroad, but that shaking a fist and screaming “complicity” is neither a commercial nor a moral philosophy. That the business of technology has become statecraft, but that game makers don’t really care much about politics. That things are complicated, and dirty, and lustrous, and real. If games ever can do good for the world, this is perhaps all they have to offer. To remind us of contingency, to give every move an orthogonal weakness. To impose a doubt for every certainty, while still admitting the need to carry on, out of vanity and shame as much as ambition and hope, to ride higher like Bellerophon on Pegasus to touch Olympus, all the while secretly knowing that we are not gods, that we will be toppled. And to hope that when we do someone will take us in, and that we won’t die alone.